He’s the bad guy, by the way. In case that needed pointed out. Halo Wars 2 needs someone bigger and nastier than the Covenant and the Flood to keep the hype train rolling. Turns out that’s this dude, Atriox, a really quite angry Brute who helped with the Covenant’s war for them – and then started waging against them. Seems like quite the badass. Here’s what we think of Halo Wars 2 so far – it’s an odd beast. That cinematic trailer came out of The Game Awards last night. Isabel, incidentally, is the new AI, presumably of whatever base Atriox came and destroyed. Halo AIs really do not have a good time of it. 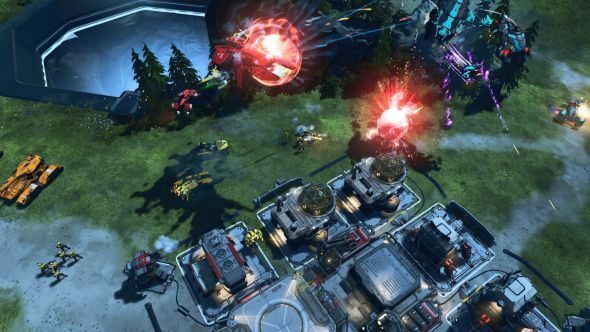 It wasn’t the only Halo Wars showing either, with a trailer for the “Definitive Edition” of the first game also making the rounds. That’s got everything you’d expect – improved graphics plus all the DLC in one neat package. The remake of Halo Wars is due on December 20, available as a pre-order bonus for Halo Wars 2, which won’t be with us until February 21, 2017.